The objective of the Breast Screening Programme is to reduce premature deaths from breast cancer through early detection by providing affordable screening for members of the public. In 2002, the Programme started out with a state-of-the-art mammography unit, a breast ultrasound machine, and an operating theatre for performing breast biopsies under local anaesthesia. Over the last 10 years, the programme has grown significantly with almost 50,000 mammograms and 5,000 breast ultrasounds having been carried out at the same cost to the public as in the initial years. About two years ago, the Programme purchased a direct digital mammogram machine with stereostatic attachment as another important addition to the clinic to aid in early detection and this machine is the first of its kind in the region. [Source]. You can call the Society at (246)-436-8888 or 427-9005 for more information. What I found pretty interesting was that the recently opened local Payless ShoeSource stores will also be offering on sale a limited-edition bracelet for only $7 Bds with proceeds of $2 Bds from the sale of each bracelet going to the Breast Screening Programme. The bracelet will feature a pink heart shaped pendant, incorporating the international symbol for breast cancer awareness, the pink ribbon. So if you don’t want the simple ribbon for whatever reason, you can get a really nice and fancy looking bracelet instead and still support this worthy cause! I’ll add a pic when I get mine. Although, I will still make donations to the cause during Pink Ribbon Week, I also wanted to show my support in my own way. 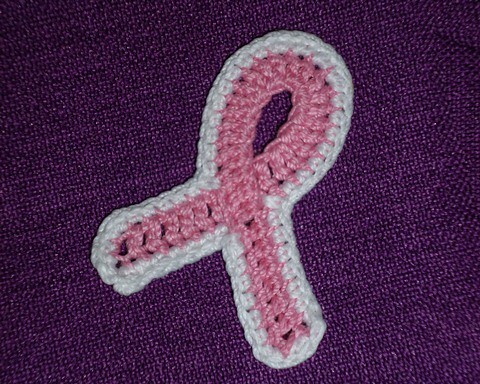 So I made my own pink ribbon pin, using a very simple and easy to follow pattern by Cylinda Mathews, which you can get for free at Ravelry here. I used a 1.25 mm steel hook with Aunt Lydia’s Size 10 Crochet Thread in French Rose and White. Then I stiffened it overnight using a Mod Podge hack and attached a brooch pin with hot glue. October is also my birth month! Yeah baby! Abbey Upgrade 3.0 in progress, people! In honour of my birthday, not only will I be celebrating all month, but I have committed to my own sewing challenge to make at least 6 things for me and only me by October 31. My plan is for at least 2 dresses, 2 tops, 1 bottom (skirt or pants), and 1 accessory. So more of that to come this week!